I love crocheting with recycled t-shirts. I cut this t-shirt into 1/4 inch strips and curled it as shown in my tutorial for curled t-yarn or tarn. 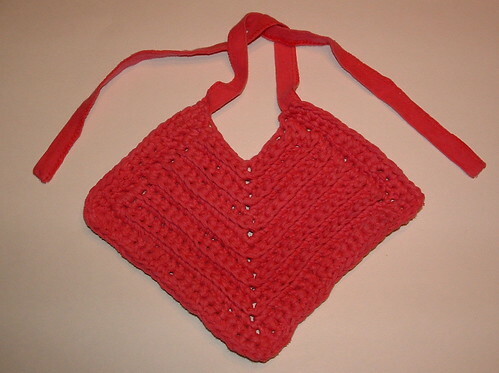 I was inspired by the diagonal dishcloth pattern when I crocheted this baby bib. I had to frog the bib several times to get the size and shape right but I think the finished bib turned out pretty good. I cut the bottom hem off the t-shirt and used it for the two tie straps for the baby bib. You could also crochet your tie straps if you’d rather but I like using the hem strips as they are stretchy and already sewn for you. I’m not sure why the bib looks red but it’s really pink. I think my camera is getting old and color blind — lol. 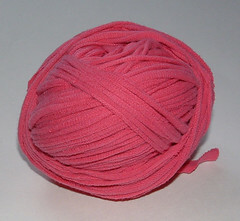 Anyway here is my t-shirt yarn ball before I started which shows the pink color better. This bib was crocheted for my little granddaughter. She’s four months old now and this should fit her nicely. It’s of course very washable and durable as it’s made completely from a recycled cotton t-shirt. The best part is that this baby bib was free making it a very frugal and green crafting project at the same time! Working in back loops only, Sc in ea st down to center, work 3 Sc in center and then Sc in ea remaining st of row. Ch 1, turn. FO. Attach t-yarn at upper RS neck edge at end of row 1. Work 3 Sc in corner and then working through both loops, Sc evenly along row ends. Working in back loops only, Sc along diagonal sides to match prior rows and work 3 Sc in center, continue up other diagonal side working in back loops only, and work 3 Sc in corner. Working through both loops, Sc evenly up last side of bib. Ch 1, turn. Working in back loops for complete row, Sc evenly around bib, working 3 Sc in corners and in center space. Ch 1, turn. Working in both loops now, Sc evenly around bib, working 3 Sc in corners and in center space. FO and weave ends under. Hand stitch or machine sew a tie strip to each side of bib at upper edge as shown in pattern. Wow, what a creative idea! Great for gifts too. I don’t crochet, but a friend of mine does…I definitely need to show this to her. .-= Tara´s last blog ..Some Real Costs of Going Green =-. I love this!! This a great idea. There are not many T yarn patterns. Thank you for sharing. .-= Chriss´s last blog ..Lettuce on my window sill, Living the Handmade Life……. =-.